Blake Hall Central Line Station and Greensted Church are a rather strange combination of subjects for a single post, however I hope the reason for combining these locations becomes clear. If you look at the following extract from a 1963 London Underground map, you can see the red of the Central Line extending at the top right corner from Epping, through North Weald and Blake Hall to Ongar. This route out to rural Essex did not start as the Central Line. 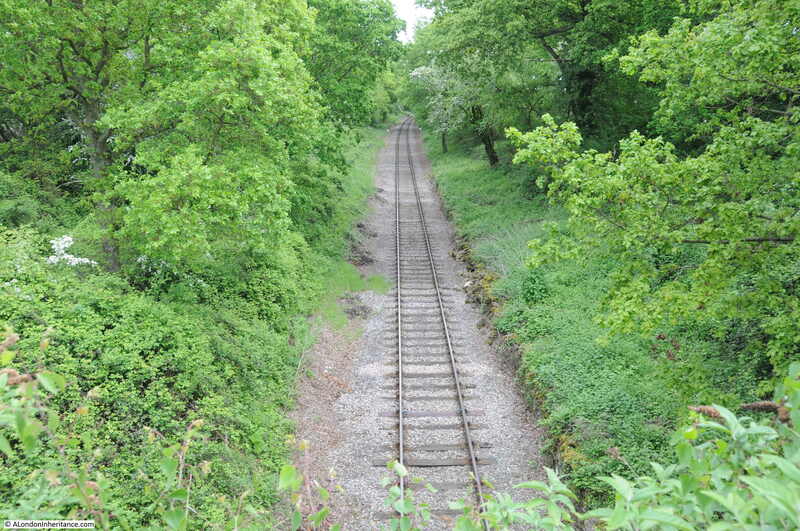 Built as a single track extension from Loughton to Ongar by the Eastern Counties Railway in 1865. 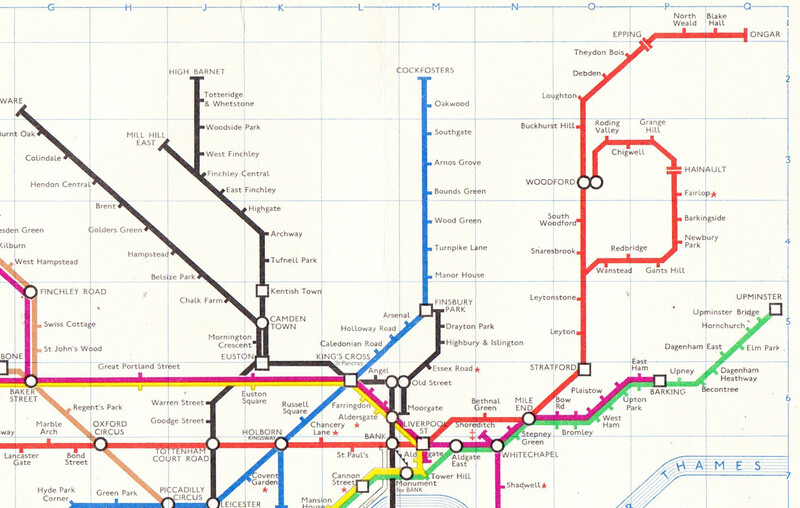 This extension provided a direct route from Ongar, through Epping and Loughton, and then to central London, with fourteen trains a day making the full journey out to Ongar. The name of Blake Hall is after a country house with the same name, and as evidence of the very rural nature of the station’s location, the Blake Hall house is well over a mile away from the station. There appears to have been very little justification for a station at Blake Hall, however it may have been a requirement of the Blake Hall land owner, and a small goods yard for the distribution of coal and the collection of agricultural produce for delivery from the surrounding farms to the centre of London, probably also supported the provision of a station. The extension of the Central Line, which had been delayed by the war, reached Loughton in 1948, with the original steam trains then continuing from Loughton on to Ongar. The route from Loughton to Epping was electrified in 1949, extending the Central Line further, and rather than leave the short route from Epping to Ongar under separate control, it was transferred to the London Transport Executive, but continuing to run steam trains. In the 1950s, the line between Epping and Ongar was upgraded with a limited form of electrification allowing electric passenger trains to run, however goods trains continued to be powered by steam. Due to its rural location, Blake Hall was the least used station on the London Underground network. The goods yard was closed in 1966 as the transport of goods moved from rail to road, and Sunday passenger services also ended in the same year. 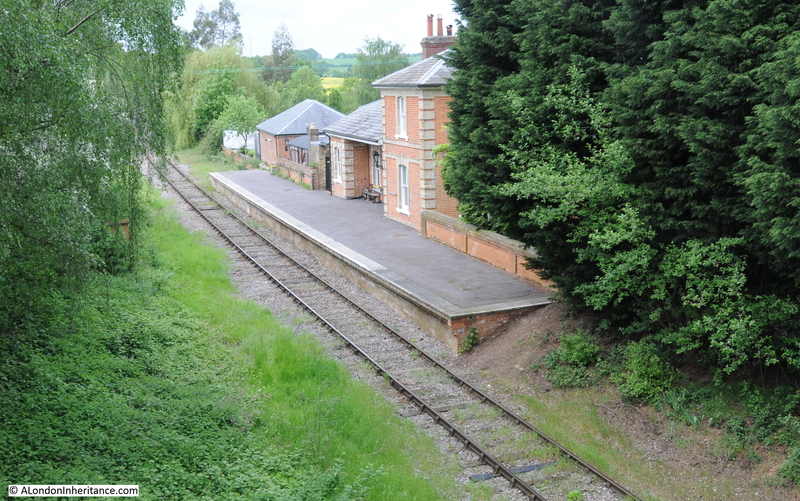 Blake Hall continued as a stop on the Ongar extension of the Central Line, but was never going to attract the numbers of passengers which could justify keeping the station open. Closure of the station was announced in 1981 and at the end of the October 1981 the last Central Line train stopped at Blake Hall and the station was closed on the 31st October 1981. 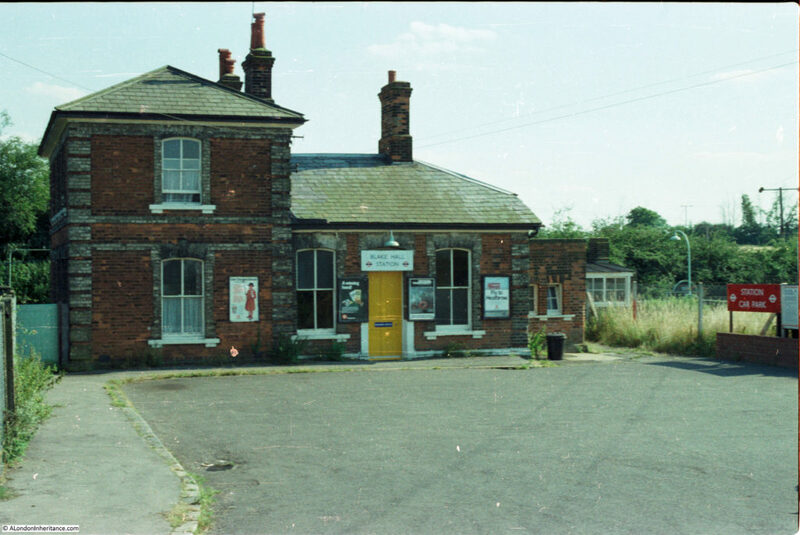 In August 1981 I took a trip out to Blake Hall to take a few photos of the station before closure, and last weekend I made another visit to see how the station had changed in the intervening 37 years. The same view in May 2018 (although at a slightly different angle as I had to move to a different point on the bridge as tree growth has completely obscured the view from the original position). The station buildings are now a private house. The platform is not the original platform. The original platform was demolished soon after closure, however the current platform was built in 2013 by the owner of the old station buildings. The new platform is much shorter in length than the original. 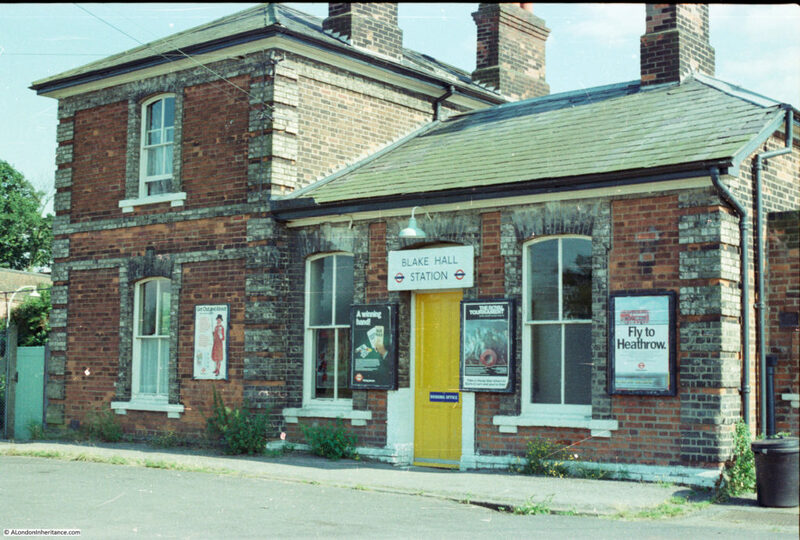 Another of my 1981 photos of Blake Hall station. I could not repeat this view today as trees have grown to completely obscure this view. Another view of the station entrance showing London Transport posters, advertising season tickets, and transport options to get to the Royal Tournament at Earls Court and Heathrow Airport. The old station building has been converted to a private home and the station approach road from Blake Hall Road is blocked by gates, so I could not get any photos of what the original station entrance looks like today. The photo below shows the same view today. Note the additional rails in the above 1981 photo which provided the electrical supply to the trains. 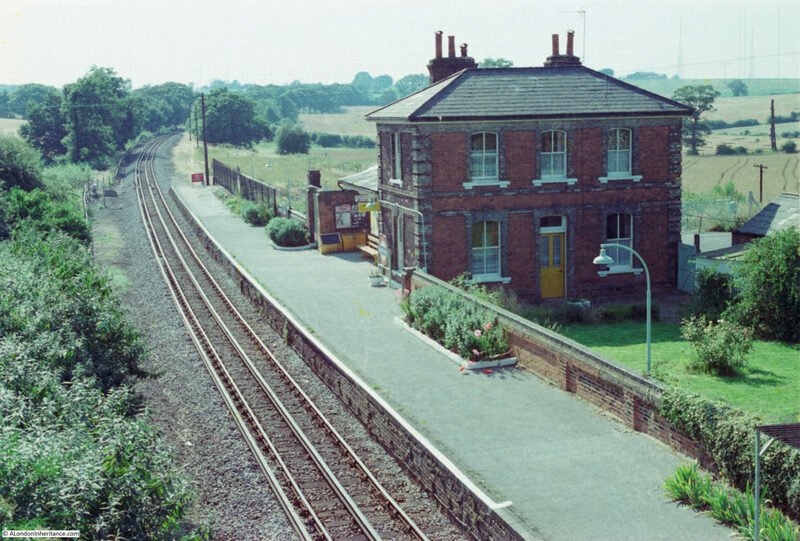 Although Blake Hall Station closed in 1981, the Epping to Ongar extension of the Central Line continued in operation until the 30th September 1994 when the line closed. Continuing losses and the lack of any future development in the area that would boost passenger numbers could not justify keeping the line in operation. 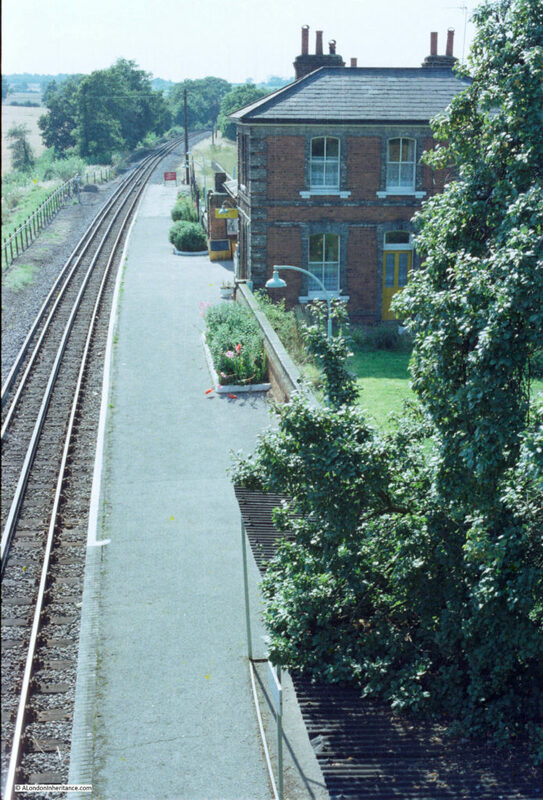 Soon after closure the line was purchased by a private company, with the intention of restarting train operation, however the failure to launch passenger trains led to the formation of the Epping Ongar Railway Volunteer Society who worked with the owner of the track and stations to restore the line between Ongar and North Weald to a point where diesel and steam trains could start running. The Epping Ongar Railway Volunteer Society now run a weekend service on the line during the spring and summer months, and quite by chance whilst I was taking the photo of the station from the bridge, I could hear the unmistakable sound of a steam train in the distance, and a few minutes later I was treated to the sight of a steam train running again alongside Blake Hall Station. I did take photos in the 1980s of all the other stations between Epping and Ongar and the Central Line trains on this short extension, however I have only found the Blake Hall negatives – the challenges with a maximum of 36 photos on a single cassette of film. 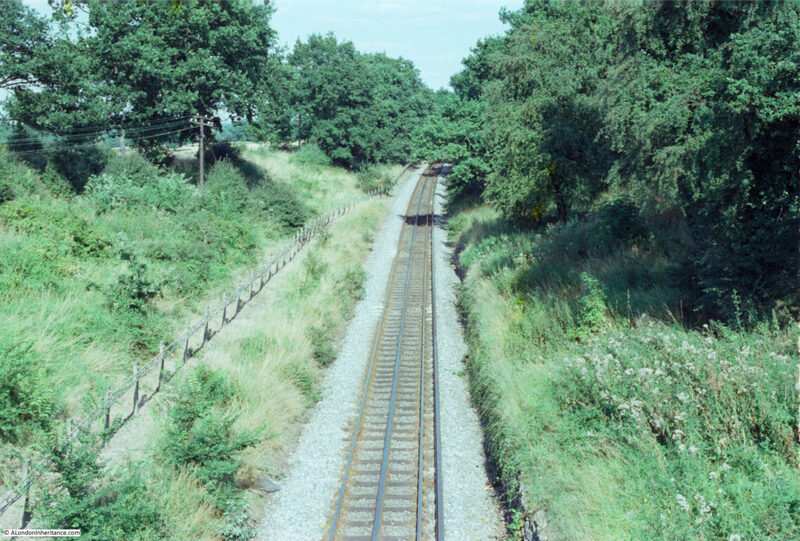 Hopefully I will find and scan my film of the rest of this small bit of the Central Line in rural Essex. 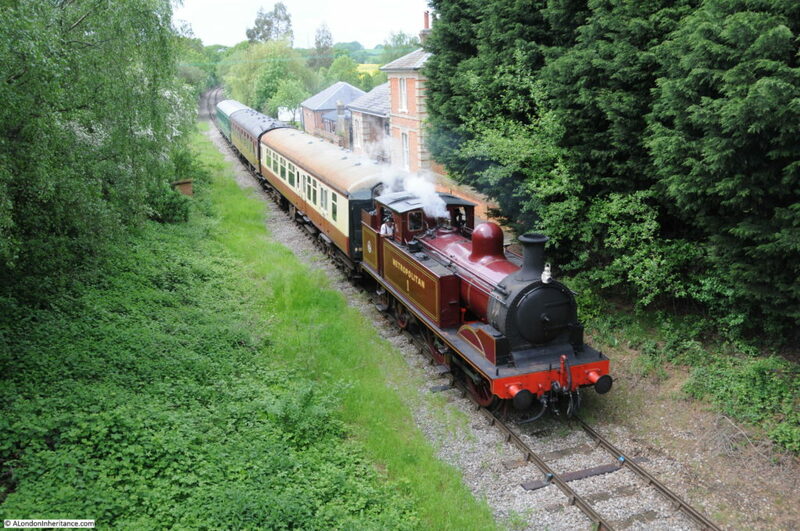 Full details of the train services now running between Ongar and North Weald can be found on the website of the Epping Ongar Railway. 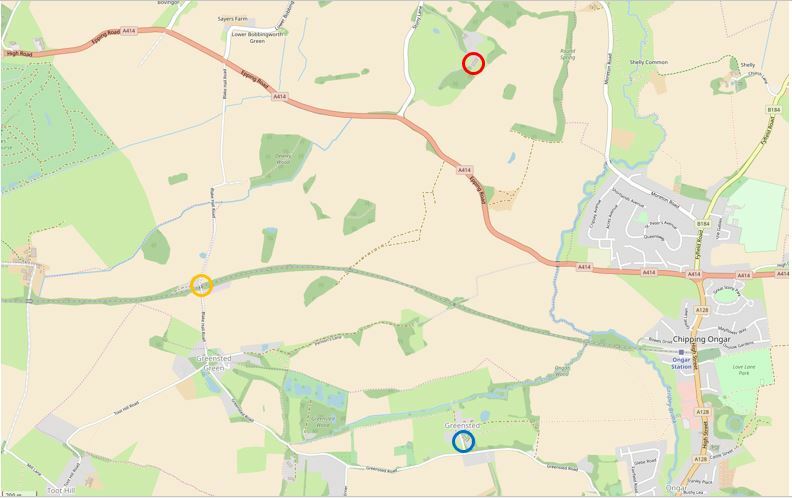 The following map extract from OpenStreetMap shows the location of Blake Hall station (the orange circle) and how remote the station was from any major settlement. Blake Hall, the source of the name of the station is shown at the location of the red circle – it is some distance away. 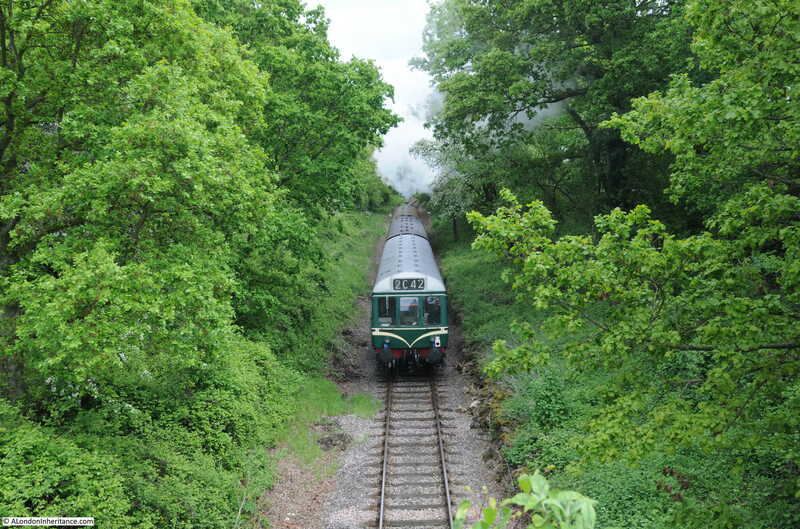 The route of the railway can be seen as the green line running left to right, to Chipping Ongar. Greensted Church is about one mile from Blake Hall station. 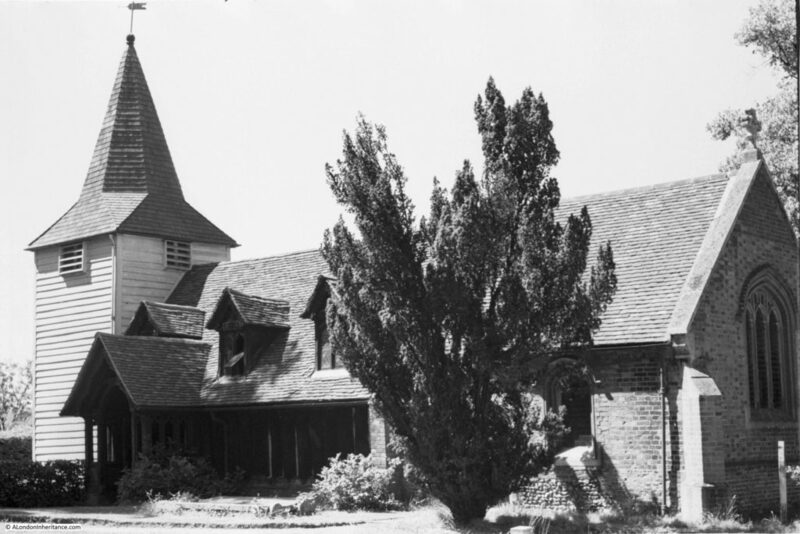 When scanning my father’s photographs there were a few photos of the church that he took in 1953. There are no other local photos on the same strips of negatives, so I have no idea why he was here, did he travel out by the Central Line or on his bike. 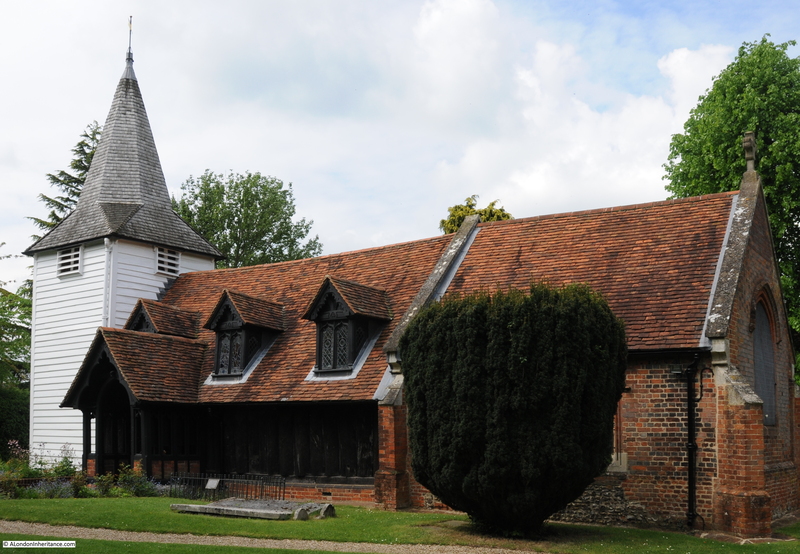 Greensted Church is rather special, it is the only wooden church to have survived from before the Norman conquest, with the wooden walls of the nave dating from around 1060 – the oldest wooden Church in the world. My photo from May 2018 is shown below. Greensted Church is identical in the two photos, as you would expect as the 65 years between the two photos is nothing compared to the 958 years that the nave of the church has been here in Greensted. 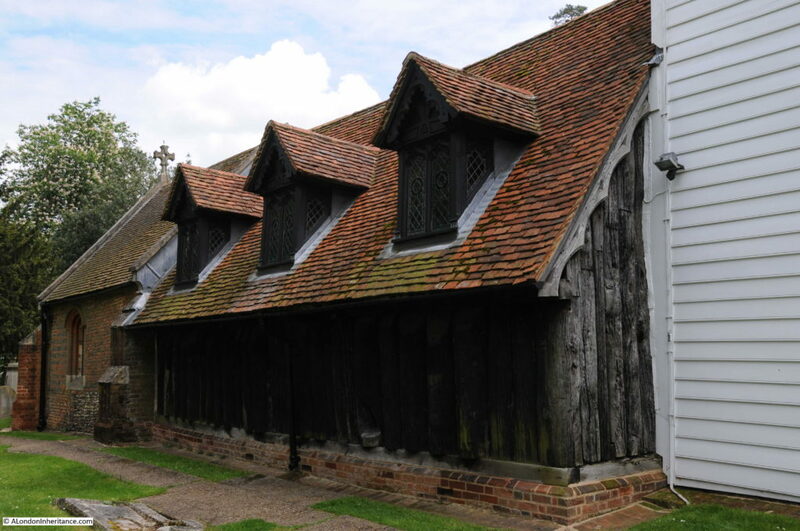 There may have been a church on the site as early as the 6th or 7th century, however the Greensted Church of today developed in stages over the years. In the photo above, the original Saxon nave of the church is the section to the right of the tower. 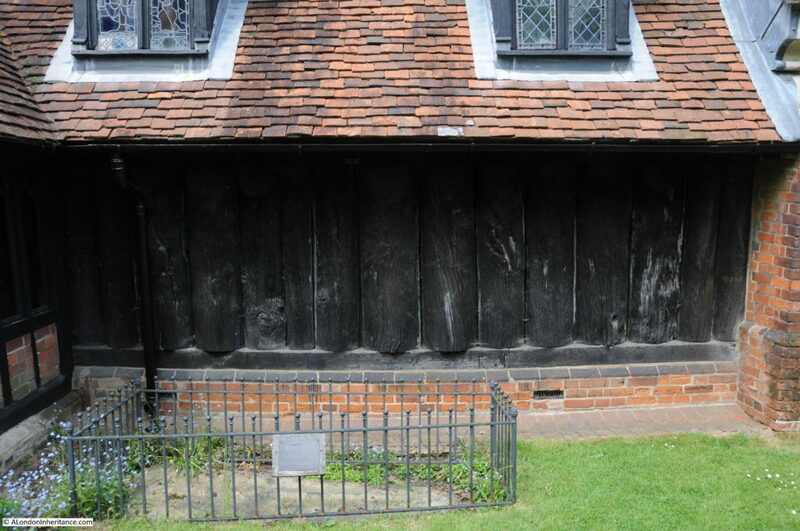 The wooden logs forming the main part of the wall have been dated to around 1060. The logs were shortened and a lower brick wall added when decay in the logs was found during restoration of the church in 1848. The porch and windows in the roof are Victorian and the tiled roof is Tudor. The chancel to the right of the nave, behind the tree has Norman origins, but is now mainly Tudor side wall and Victorian end wall. 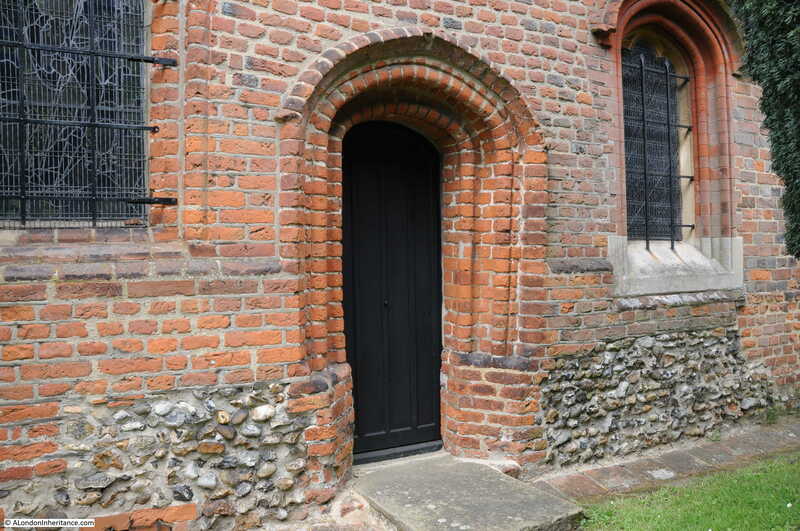 In the photo below, the Tudor door, window and brickwork can be seen, with the remains of Norman flint walls on either side of the lower part of the wall. There are also, possibly, a couple of Roman tiles at the top of the flint on the left. There is no fixed date for the tower, it may be 17th century, or possibly earlier. One of the bells in the tower has the date 1618. 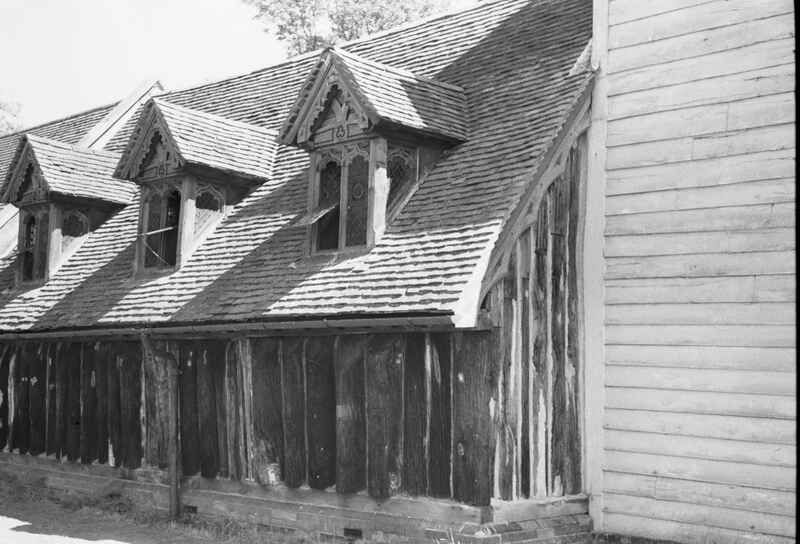 To construct the nave of the church, 54 oak logs were split lengthwise with the flat side on the interior of the church. Tongues of wood fixed into grooves running down the side of the logs were used to hold them together and seal gaps between adjacent logs. A view of the southern wall of the nave with the wooden logs. originally these would have extended into the ground and met a thatched roof at the top. 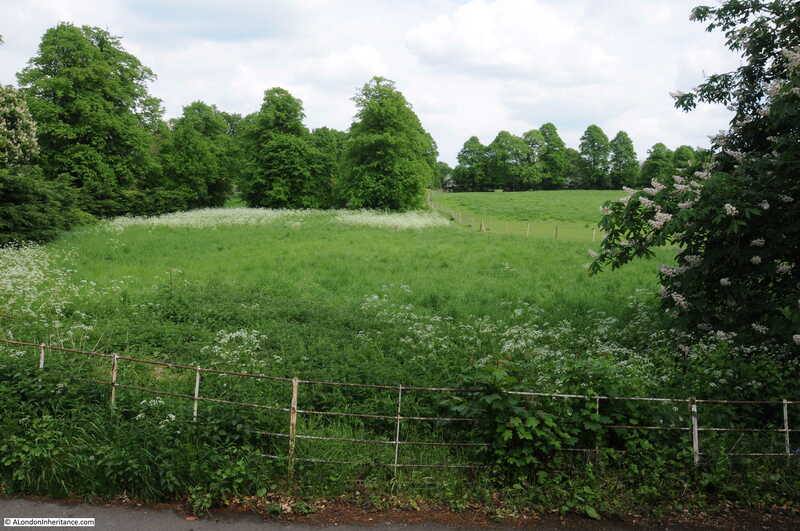 The fenced grave in the above photo is thought to be a 12th century Crusaders grave. 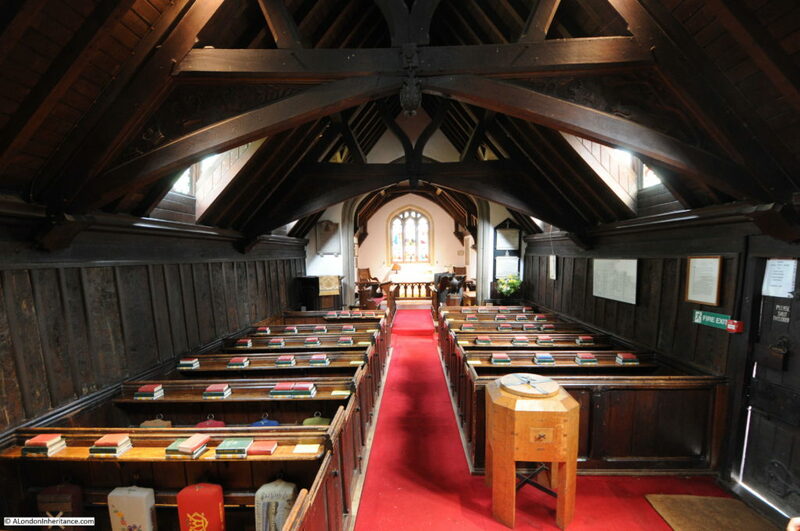 The following photos show the interior of Greensted Church. The interior was much darker than the photos suggest. I was using a handheld camera so to avoid camera shake, I increased the ISO setting which has the effect of brightening the scene. 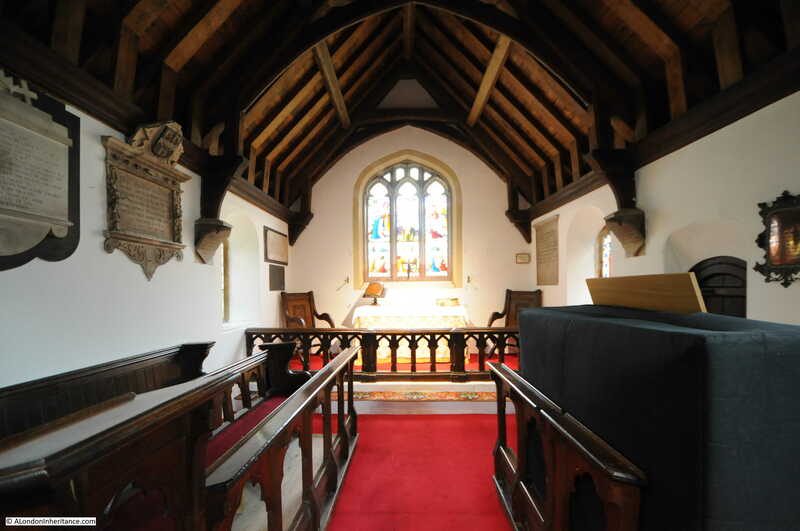 The following photo is from just inside the entrance porch, looking along the nave to the chancel at the end of the church. 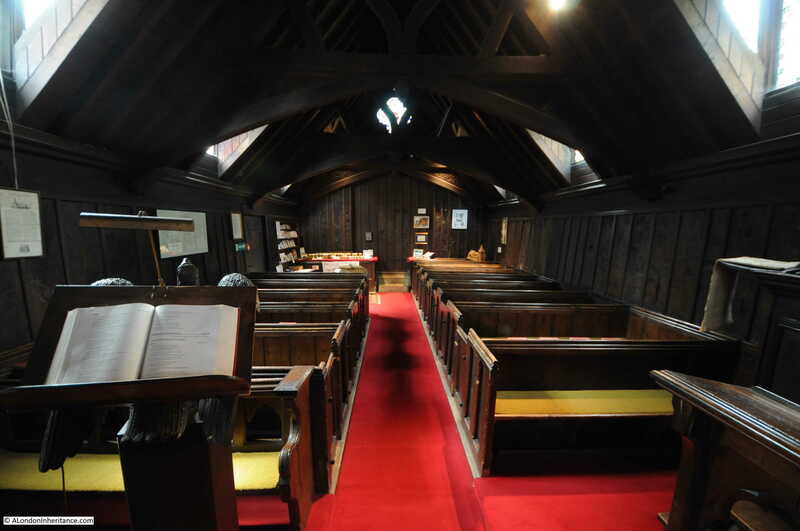 The flat side of the log walls can be seen running the length of the nave. This is the other side of the hole – looking in from the outside of the church with one of the roof windows on the southern side of the church visible. The small window has been called a lepers squint – a small window in the side of a medieval church through which lepers could watch a church service, however this is very unlikely given the size of the hole and the very limited view of the church that it provides. 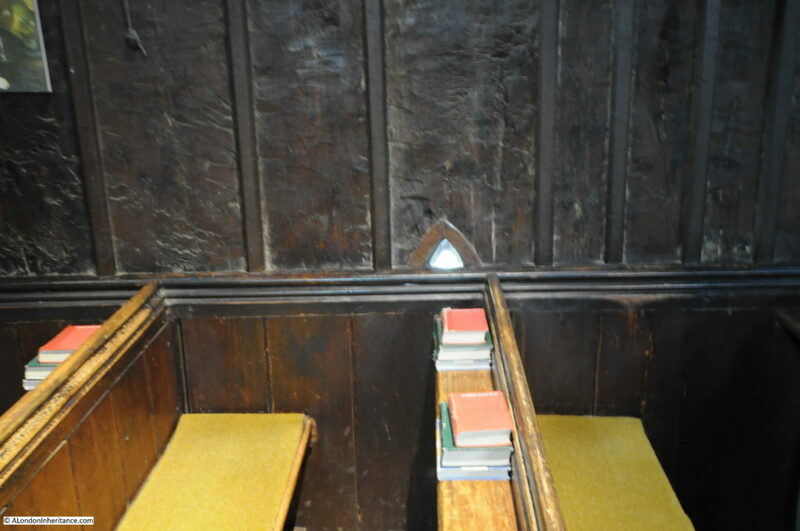 It may well have been just a small window, or possibly a hole through which holy water could have been passed to a small font placed on the shelf cut into the wooden log. 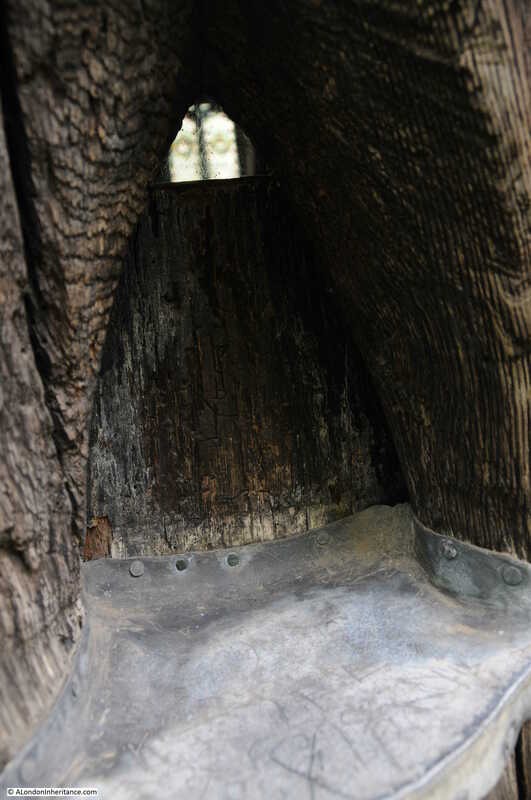 The shape of the hole in the log and the flat shelf makes this later use more likely. The old Blake Hall Central Line Station is only a mile from Greensted Church so the trip out to Essex provided the perfect opportunity to visit the site of one of my earlier photos when the Central Line was still running out to this part of rural Essex, and the location of one of my father’s earlier photos. Two very different locations, but they are in their own way, fascinating landmarks on the Essex landscape. This entry was posted in London Churches, London Transport and tagged Blake Hall Station, Central Line, Greensted Church on May 20, 2018 by admin.